Several months back a good friend Vera Brandes who is the head of music medicine research at Paracelsus Medical University in Salzburg sent me a link to an event happening at the university in our home town of Ogden, Utah. The event- The Interdisciplinary Society for Quantitative Research in Music and Medicine Inaugural Music & Medicine Symposium. I had heard nothing of the young organization or the event about to take place in my own backyard. I was embarrassed a friend in Austria had to bring it to my attention. It was hard to believe such an important event was being held in our field of music effects research, in Ogden, and we knew nothing of it! So…Once I got the news I contacted the organizer Dr. David Akombo, co-founder of the organization and Assistant Professor of Music at Weber State University. We arranged a meeting, and quickly found many synergies. In short order ABT became the main sponsor and David and I went to work to expand the one day symposium to a full week of events with a partnership between Advanced Brain Technologies, Weber State University and The Interdisciplinary Society for Quantitative Research in Music and Medicine. 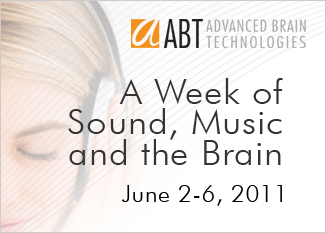 A Week of Sound, Music and the Brain is Five Powerful Events in ONE! June 2-6, 2011 some of the world leaders in music medicine research will gather in Ogden, Utah along with students, musicians, educators, healthcare providers, and others interested in music and the brain. June 2- Healing at the Speed of Sound™ Workshop. A Day with Don Campbell and myself, ABT Provider Forum, and ABT Open House. June 3- ISQRMM Inaugural Music & Medicine Symposium. Keynote address by Mark Jude Tramo of The Institute for Music & Brain Science, research papers presented by investigators from across the world, live music performances, and a workshop I will lead on music listening therapy. June 4-6- TLP Provider Certification Course for healthcare, education and music professionals to certify to offer The Listening Program® and other ABT solutions to their clients and students. This is going to be a life changing week for those who attend. I hope you will join us and help spread the word! Please visit the event website to register online and learn more. We have created a new monthly newsletter at Advanced Brain Technologies. Brain Notes News will bring you the latest company information as well as up to date news from the fields of neuroscience and music effects research. Subscriptions are free. To sign up visit the Advanced Brain Technologies homepage. Music has a number of positive physiological and psychological benefits. Over the centuries, the therapeutic benefits of music have been extensively studied in various settings. More recently, neuroimaging studies have helped us better understand the effect of music on the brain. The music of Ostad Elahi has gained tremendous attention in the West since its release to the public in the 90s as a unique and powerful music. Ethnomusicologists, neuroscientists, and musicians have begun to explore the potential benefits of his music, and to discusss adapting therapeutic music programs based on unique musical repertoire like his. Music for the Mind is a superb example of a sound stimulation auditory training program that can help facilitate profound changes through the power of music and active listening. I was fortunate to co-produce Music for the Mind with Richard Lawrence and Dr. Kamran Fallahpour, and later a second program with Greg Lawrence and Dr. Fallahpour. I am greatly looking forward to contributing to a lecture on the intricate music of Ostad Elahi, a master musician and virtuoso of the tambour, this lecture takes us on a magical journey of the power of his music. The lecture is at Winifred Smith Hall, Clair Trevor School of Arts, University of California, Irvine on Thursday February 3rd, 2011 from 7-9 pm. It is sponsored by UCI Clair Trevor School of Arts, UCI Susan Samueli Center for Integrative Medicine, The Department of Pharmaceuticals Sciences, and The Nour Foundation. Proceeds will be doanted to the center initiatives on autism. If you live or will be in Southern California on February 3rd I hope you will consider joining us for this exciting and eductional evening! In the summers of 2004-2008 we ran the Advanced Brain Technologies (ABT) International Conference in the beautiful settings of The Canyons Resort in Park City, and Zermatt Resort in Midway, Utah. ABT providers, customers, professionals, parents and others would travel from the world over for 3 days of lectures, workshops, music, networking, food and friendship. All of us united through a shared interest in helping people attain all they can in life by improving their brain health and performance. When the global financial crisis hit we made the difficult decision to discontinue the conference until the economic recovery. And still we wait… While the right decision, we and those accustomed to our annual event have been feeling an immense void. So, rather than put on the BIG EVENT, we decided to organize 1 day of great presentations, music, and networking at our first ever East Coast Symposium in New Jersey this October. The ABT Symposium 2010 is taking place at Children’s Specialized Hospital in New Brunswick, New Jersey on October 24, 2010. New research on Advanced Brain Technologies neurosoftware and neuromusic programs will be presented. Learn about the Lucker model of auditory processing and his theory about the effects of The Listening Program® (TLP). Discover Learning Ears, Ear-Voice training that works with TLP to improve learning, language and communication abilities. Hear about a TLP brain injury protocol being trialed at a pediatric rehabilitation hospital.Listen to diverse case presentations from practicing ABT providers. Experience live music performances which will demonstrate the effects of live music performance on group dynamics. Engage in a discussion about activity recommendations for listeners. And, Network with other therapeutic and educational professionals. The focus of this highly anticipated symposium will be new information on research, treatment strategies, and programs for diverse client populations ranging from neurotypical to brain injured. We have a great line up of speakers including Dr. Jay Lucker from Howard University speaking on auditory processing , music from world renowned artist Nacho Arimany, and much more… Early bird discounts are available for professionals through September 15th, and we have special pricing for students and parents. For those who may be interested in training as ABT Certified Providers of The Listening Program®, you can join us at the same location on the 22nd and 23rd of October for our certification course. Please join us! To register or for more information including a list of speakers, special hotel rates, etc. please visit ABT Symposium 2010. The Liverpool Echo published an article today about the results of a pilot study which examined the effects of modified classical music and a specific protocol to help children with autism and other cognitive and developmental challenges to be toilet trained. This is a world first project, conducted by June Rogers head of NHS Liverpool Community Health’s Integrated Paediatric Continence Service. Children listened to 30 minutes of music a day through a special audio system which provided the music through both auditory pathways, air and bone conduction. The outcomes are positive and have been presented at European conferences. We now await approval for a large scale clinical trial to confirm these results in a larger sample size. Continence problems severely impact quality of life, self esteem, and have large costs associated with supporting these children as they enter school. Our protocol holds promise to help children with toilet training problems, reduce costs of services to them, and help them live a happier more fulfilling life. Note that the program name in the article is incorrect. What is referenced as the Listening Project is supposed to be The Listening Program® developed by Advanced Brain Technologies in Ogden, Utah. UPDATE: Thank you to the staff at the Liverpool Echo for making the correction to the program name! Facelift and Happy Independence Day! Thanks to Mary Cim, our brilliantly creative Art Director at Advanced Brain Technologies, The Brain Understanding Itself has received a facelift. Please comment and let me know what you think! For those of you who are as fortunate as I to be an American citizen I wish you each a Happy Independence Day. Interestingly since I live in Utah and July 4th falls on a Sunday this year, we are celebrating tomorrow, July 3rd. I have never been able to quite get my hands around this idea, but in this great state of Utah this is how it is done. Regardless of the day of celebration, July 4th Weekend is always a special time for me and one in which I feel immense gratitude to our founding fathers for their foresight and wisdom, to our military personnel for their commitment and bravery, and my family, friends, and fellow citizens as we unite and celebrate what it means to be Proud Americans! Enjoy your parades, picnics, and fireworks and God Bless America!